Leading transmedia and animation studios FlickerLab announces Jordan Geary as new Head of Production and Development. Leading animation and transmedia company FlickerLab (http://www.flickerlab.com) has appointed Jordan Geary as its new Head of Production and Development. In this new position, Mr. Geary will oversee the production of all content for the company’s projects and manage company operations. 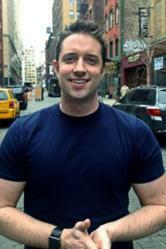 Jordan Geary is a seasoned creative producer, director, show-creator, and on-air personality. Prior to joining FlickerLab’s team, he worked on such notable and award- winning productions as 3rd and Bird for Disney Junior/Cbeebies, Wonderpets for Nickelodeon, and Kappa Mikey for Nicktoons. Since joining the company, Geary has incorporated his production expertise while jumping into the interactive realms of game and app development. This has included shepherding numerous large-scale projects, including 100+ interactive eBook properties for industry leaders such as Barnes & Noble and Penguin, the award-winning broadcast series Joy Berry for The Hub, the animated series How The Body Works for Kids Health, and more. FlickerLab is an animation and transmedia company that has generated thousands of hours of award-winning content across all media: for broadcast and film, e-books and apps. FlickerLab’s primary focus is to create and develop story universes that easily expand across media platforms and to innovate and transform the technological toolset available to do so. Founded in 1999, FlickerLab is based in Soho, NYC. View FlickerLab’s extensive portfolio http://www.flickerlab.com/work.cfm or call 1-212-560-9228.